The new EOS R is Canon's first ever 35mm full frame mirrorless camera. 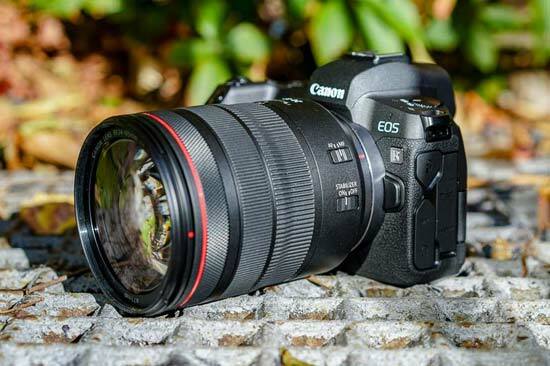 The Canon EOS R has a 30.3 megapixel CMOS sensor, DIGIC 8 image processor, 4K UHD video recording in 10-bit 4:2:2, a touch-screen interface, 5,655-point Dual Pixel CMOS AF System that can focus as low as -6EV, ISO 50-102400, a 3.15-inch 2.1 million dot vari-angle LCD monitor, a 3.69 million dot EVF with 100% scene coverage, integrated Wi-Fi / Bluetooth connectivity, 5fps burst shooting with AF tracking (8fps without), CR3 14-bit RAW support, USB 3.1 in-camera charging and a flash hot-shoe. 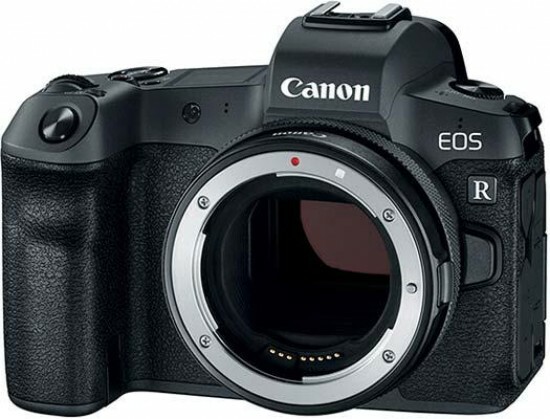 The Canon EOS R is available in black priced at £2,349.99/ €2,729.99 / $2299 body only or £3,269.99 / €3,819.99 / $3399 with the RF 24-105mm f/4L IS USM kit lens. Joining the likes of Sony, Nikon, Leica and (soon) Panasonic, Canon have launched a new 35mm full-frame mirrorless camera, the EOS R. The company already have the successful range of M-series mirrorless cameras with APS-C sensors, now it has turned its attention to the higher end of the market. The EOS R is slightly more expensive than the Sony Alpha A7 III and Nikon Z6, with the upcoming Panasonic S1 set to be priced in the same ball park. Sony are the clear market leaders, having spent the last few years focusing most of their attention on full-frame mirrorless, while Canon and Nikon have concentrated on DSLRs and Panasonic on the smaller Four Thirds format. As well as the new EOS R camera body, Canon have also launched a brand new lens mount, called the RF mount, with four lenses announced alongside the EOS R - the RF 24-105mm F4 L IS USM kit lens that we predominantly reviewed the camera with, the RF 50mm f/1.2L USM, the RF 28-70mm f/2L USM and the RF 35mm f/1.8 MACRO IS STM. The 24-105mm and 35mm lenses are roughly the same size as their DSLR equivalents, but the 50mm and 28-70mm are much bigger, with Canon taking advantage of the new RF mount to try and differentiate their system from the opposition by making them faster than what's gone before. Traditionally mirrorless cameras have always concentrated on being smaller and lighter than their DSLR rivals, but with the EOS R Canon have instead gone for the ultimate in image quality, at the expense of size. In addition to the four new RF mount lenses that have been unveiled so far, it's also possible to use your EF and EF-S (but not EF-M) mount lenses on the EOS R by fitting one of the four new lens adapters. There's the EF-EOS R adapter that's supplied in the box, the EF-EOS R adapter with built-in control ring, EF-EOS R adapter with built-in circular polarizing filter, and finally the EF-EOS R adapter with built-in variable neutral density filter. We suspect that most people will opt for the cheapest and simplest EF-EOS R adapter, but it's good to see Canon innovating here and giving people a lot of choice. 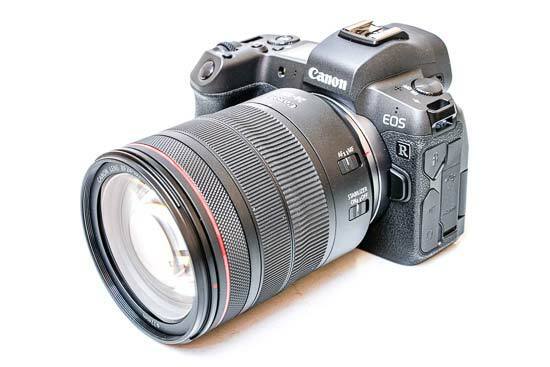 The EF-EOS R adapter with the built-in control ring is particularly noteworthy, as it provides the same functionality that the RF lenses have built into them, namely an additional ring on the lens that can be used to control certain key camera settings. Although not a new idea in the wider photography world, this is the first time that Canon have incorporated this idea into their interchangeable lenses. 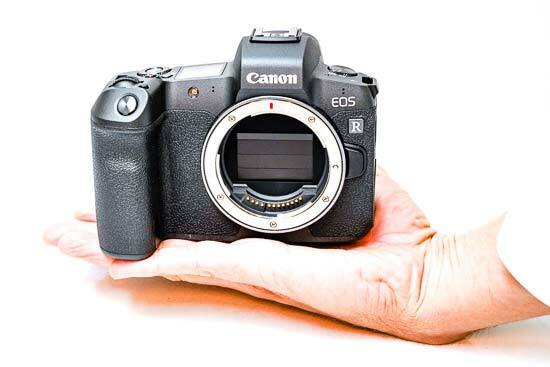 In the case of the EOS R camera itself, it's about the same size as a mid-range DSLR camera, something like the EOS 6D Mark II in Canon's current range. When you pair it with the 50mm or 24-70mm RF lenses, though, the whole package becomes much bigger than its DSLR equivalent. You do get the faster f/1.2 and f/2 apertures, though, which no DSLR or mirrorless lens can currently match in a like-for-like lens comparison. As well as being sized like a prosumer DSLR, the EOS R also looks like one at first glance, with a chunky handgrip on the front that's much bigger and better than the one on the Sony A7 III. The shutter button is set into the front of the grip, there's a porthole for the AF assist light, a lozenge shaped button for releasing the lens, and the 54mm diameter RF mount. So far, so DSLR-like. 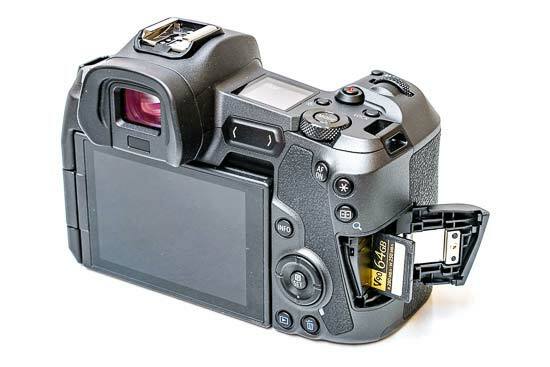 You might notice a brand new feature when removing the lens, though - the sensor is protected by a physical cover when the camera is turned off, a very neat idea that should cut down on unwanted dust on the sensor. Behind that cover lies a 30.3 megapixel CMOS sensor without an optical low-pass filter. 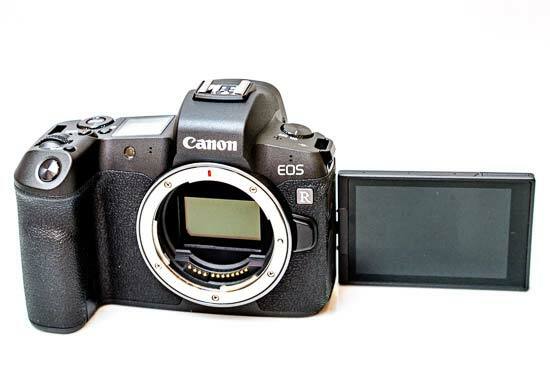 This shares the exact same specification as the sensor inside the EOS 5D Mark IV, although Canon were at pains to point out that the two cameras don't share exactly the same sensor. Coupled with the latest Digic 8 processor, the EOS R has an ISO range of 100-40000, extendable to 50-102,400, which again matches the 5D Mark IV. Something that unfortunately isn't hiding behind the cover is and in-camera image stabilisation system. Yes, Canon have for better or worse decided to omit IBIS, at least from the EOS R camera, and build it into some of their lenses instead, as usual pointing out that a lens-based system provides technically better stabilisation whilst making the camera smaller. Whilst this may be true (and the jury is out on that), it certainly doesn't do the EOS R any favours when comparing it against its main rivals, with both Sony and Nikon opting for IBIS, which means that any lens that you mount on those cameras instantly benefits from around 5 steps of stabilisation. 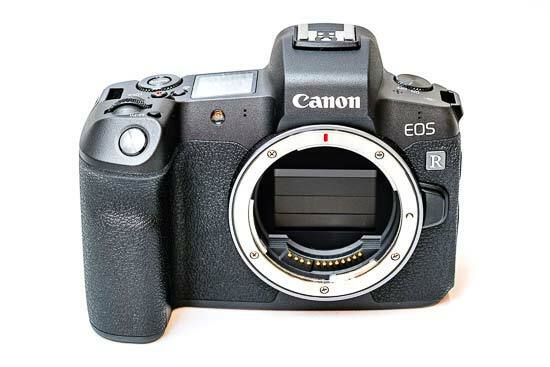 For some users, this missing feature alone will be enough to write off the EOS R, and whilst we wouldn't go that far based on IBIS alone, it's certainly a strike against Canon's new camera, especially when only two of the new RF lenses are stabilized. Thanks to the Digic 8 processor, the EOS R is the latest Canon mirrorless camera to offer 4K video recording, which, in conjunction with the vari-angle LCD screen that be rotated to face forwards and the Mic-in port, promises to make it something of a Vlogger's dream ticket. All is not quite as rosy as a glance at the spec sheet would indicate, though, as the EOS R automatically applies a massive 1.7x crop on the sensor in 4k mode (just like the 5D Mark IV) , which effectively changes the focal length of the fitted lens, making wide-angle framing much more difficult. So difficult, in fact, that you'd currently need to use a non-RF lens achieve a natural viewing angle for video. Thankfully the excellent Dual Pixel CMOS AF system does work when recording in 4K, unlike on the recent EOS M50 APS-C camera, and it can record internally at 4:2:0 8-bit and externally at 4:2:2 10-bit, with C-Log as standard. There are a choice of 30p or 24p frame rates for 4K and up to 60p for Full HD, although if you to want to shoot 120fps slow-motion, you have to drop the quality all the way down to 720p. All-in-all, video on the EOS R is something of a mixed bag, which is a real missed opportunity on Canon's part. Also sure to draw criticism, from certain parts of the Internet at least, is Canon's decision to only implement one card slot on the EOS R. And unlike Nikon's move to the XQD format, Canon have also decided to stick with SD UHS-II cards, which are much more widely available, but technologically more limited in the long run. On a more positive note, Canon have stuck with the same LP-E6 battery format that is used on a large number of its DSLR cameras. The supplied LP-E6N battery is a actually a little different, though, in that it cleverly allows the camera to be charged via its USB-C port, which means that you could potentially dispense with the supplied charger altogether when traveling. Recharge time is as short as when using the charger (depending on the power source). We also really like the EOS R's EVF and the LCD screen. The former has a very high resolution of 3.69 million dots and a magnification of 0.76x, which almost but not quite matches the Nikon Z7/Z6 which offer 0.80x. The EOS R has the edge when it comes to the 3.15-inch LCD screen, though, with the 2.1 million dot resolution and especially its vari-angle nature making it a joy to use. Only the upcoming Panasonic S1R/S1 cameras also offer a similar screen, with Sony and Nikon opting for screens that only tilt up and down, less useful for solo video shooters. Like Nikon, Canon have also implemented a handy top-panel LCD on the EOS R, which provides quick and easy viewing access to most of the camera's key settings, with the dedicated button alongside it toggling between two different screens of information and also allowing it to be lit up in the dark via a longer press - very neat. Less satisfying, though, is the shooting mode dial - or rather, the lack of one. Despite years of refinement on their DSLRs, Canon has decided to completely omit the traditional dial and instead opt for a new Mode dial. 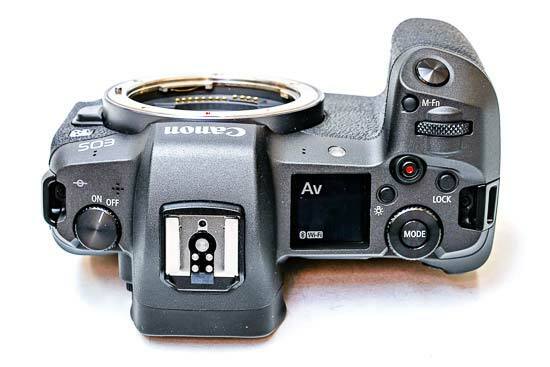 You have to press this button once, then choose the still shooting mode which is displayed in the EVF, LCD screen and top-panel LCD using one of the control dials, then go back to shooting. If you want to choose one of the video modes, there's an extra press of the Info button to view them. It's at best a curious design decision that makes the EOS R look less cluttered and complicated, but ultimately slows down the operation of the camera, especially if you tend to switch between shooting modes a lot. 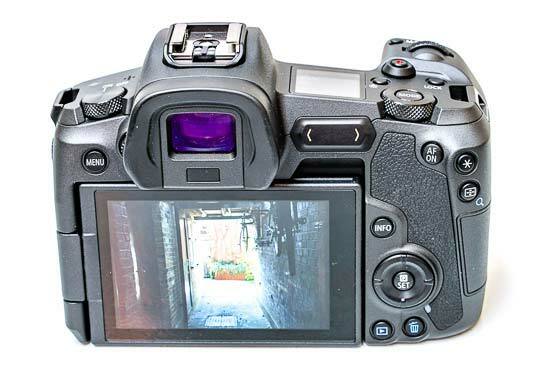 Equally mystifying is the new touch-sensitive M-Fn Bar on the rear of the camera, located underneath your right thumb. This brand new unmarked control can be customised to access different key settings, and the way that it works can also be customised too. For example, you could set it to control the ISO speed by either tapping the Left and Right buttons or by swiping across the bar to move more quickly through the settings, and you can also set it to do things during image playback. The Customize M-Fn bar menu option is the place to go to configure this key control. In practice, it's fair to say that the M-Fn Bar takes some getting used to, so much that we're still not convinced that it's such a good idea, especially as it occupies the space where an AF joystick and/or an AEL button would naturally go. The EOS R consequently has neither, which make is it much harder to set the AF point than on rival cameras. Instead you have to use the navigation pad or touch and drag the AF point on the rear LCD, both much less satisfying alternatives to a good joystick, which is something that power users will definitely miss on the EOS R.
You can at least use the whole screen when touch and dragging the AF point, or you can apportion a section of the screen, for example the bottom right to allow you to change the AF point. This is particularly handy if you find that your nose or face is accidentally moving the AF point when you don’t want it to. Which is a shame, as the EOS R has one of the most advanced AF systems on the market, Canon have built on the proven phase-detect Dual Pixel CMOS AF System in their DSLRs to develop a new variant with no less than 5,655-points. Yes, you read that right, 5,655 points! These cover almost the entire frame - 88% vertical and 100% horizontal - making tracking moving subjects easier and more precise, and allowing you to focus on off-centre subjects without having to reframe. The EOS R can also focus in low-light down to a CIPA-rated -6EV (with certain lenses), an incredible achievement that's easily the best of the full-frame mirrorless contenders. In reality this allowed us to quickly and accurately focus in near-dark conditions on moving subjects when using the RF 50mm f/1.2 lens and achieve a surprisingly high number of keepers. If you do a lot of low-light shooting, you'll love this combination (calling all wedding photographers!). Less impressive, though, is the Eye AF system, enabled as part of the Face Detect AF option rather than as an dedicated option. In the same low-light conditions, I found that it simply wasn't reliable enough, sometimes quickly identifying the subject's eye but more often than not just not recognizing it and focusing on a completely different part of the face or even body. This might be because it only works in AF-S mode, not AF-C too. It did work more reliably outside in bright sunlight, but if you've ever experienced Sony's amazing Eye AF, you'll be disappointed by Canon's implementation. Here's hoping Canon can improve it in via an imminent firmware update. When it comes to capturing faster moving subjects, the Canon EOS R also lags behind its main rival in terms of all-out shooting speed. The headline figure is 8fps burst shooting, but that's only when setting the focus point at the first frame, useful for golfers but little else. It drops to 5fps with AF tracking, and curiously again to 3fps when using the dedicated tracking priority mode, which surely would benefit from a faster rate. There's a decent buffer of 47 Raw files or 100 JPEGs, but the camera simply isn't really fast enough for sports photography. The Canon EOS R has both Wi-Fi and Bluetooth connectivity. You can use the latter as a low-power alternative to Wi-Fi to control the camera and for automatically transferring images across to your phone ready for super quick sharing. It’s also easier and quicker to set up and use than connecting to the camera’s Wi-Fi network, which is still a rather long-winded process. Overall, the handling experience offered by the EOS R is definitely something of a mixed bag. In trying to satisfy both less experienced new users and loyal DSLR owners, it falls between two stools, tending to satisfy the former rather than the latter.